Maryam Rajavi urges protection of Camp Ashraf, Iraq, on August 8. 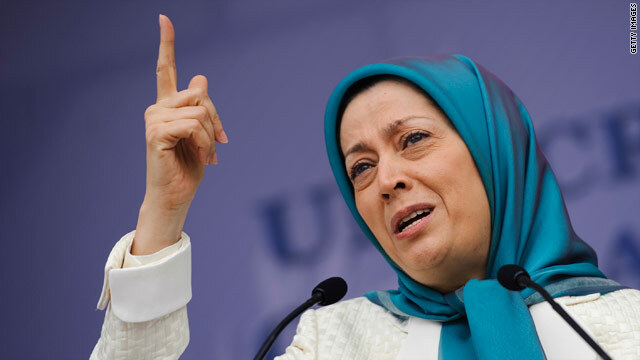 She and her husband, Massoud, are the leaders of MEK. Editor's note: Louis Freeh served as director of the FBI from 1993-2001; Lord Corbett of Castle Vale heads the British Parliamentary Committee for Iran Freedom; and Rt. Hon. Lord Waddington QC is a former British home secretary and leader of the House of Lords. Freeh has received payment for travel expenses and speaking at conferences organized by groups that want People's Mujahedeen Organization of Iran removed from the State Department's list of foreign terrorist organizations. (CNN) -- Congressional leaders and former top U.S. officials are pressing Secretary of State Hillary Clinton to remove Iran's main opposition group, the People's Mujahedeen Organization of Iran, from the State Department's list of foreign terrorist organizations. So what should Clinton do? Let's consider the background. The People's Mujahedeen, also known as the MEK, is the Iranian mullahs' worst nightmare. Since 1981 it has waged a costly and deadly battle to unseat the ayatollahs' regime, but it is a battle for the soul of Iran of which it can be immensely proud. In 1997, the Clinton administration added the MEK to the State Department's blacklist in what a senior administration official, according to the Los Angeles Times, described as a good will gesture to Iran -- thought at the time to be moving toward a more moderate form of government. The Bush administration maintained the ban, which many saw as an effort to persuade the Iranians to abandon their nuclear weapons program. But Iran is no closer to moderation and its nuclear ambitions get closer and closer to fulfillment. Former U.S. officials calling for the MEK to be de-listed include former Homeland Security Secretary Tom Ridge, three former chairmen of the Joint Chiefs, two former directors of the CIA, former commander of NATO Wesley K. Clark, two former U.S. ambassadors to the U.N., former U.S. Attorney General Michael Mukasey, a former White House chief of staff, a former commander of the Marine Corps, former U.S. National Security Adviser Fran Townsend, now a CNN contributor; and even President Obama's recently retired National Security Adviser Gen. James Jones. Their call is backed by 93 members of Congress, who have signed a bipartisan resolution urging the president to revoke the designation, and by prominent Democratic and Republican leaders such as Howard Dean and Rudy Giuliani. First, the decision to classify an organization as a terrorist group must be based on fact. Up until now, 10 courts in Britain, France, the European Union and the United States have looked at the evidence and ruled that the group is not involved in terrorism. Britain's Proscribed Organisations Appeal Commission and later the Court of Appeal looked at the U.S. State Department's reasons for listing the group as a terror organization in great detail and rejected them as irrelevant or found that the allegations' sources and accuracy could not be established. The courts confirmed that the MEK halted armed activities against Iran in 2001 and voluntarily disarmed in 2003. Second, the ban has put the lives of 3,400 MEK members at Camp Ashraf, Iraq, at great risk. In April, Iraq's Prime Minister Nuri al-Maliki, a close ally of Iran, ordered an armed raid on the camp that left 36 residents dead and 350 injured. But when a bipartisan congressional delegation questioned al-Maliki in Baghdad about the incident, he said the United States had no right to complain about such violence when it was directed at a group the State Department itself called terrorist. Lifting the ban would remove any pretext for another military assault against the unarmed and defenseless MEK members at Camp Ashraf. Finally, there is the broader issue of relations with Iran. Proponents of engagement with Iran claim that lifting the ban on the MEK would all but destroy any chance of future dialogue with Tehran. But what would be the point of such dialogue? Does anyone seriously believe the mullahs could be persuaded to throw away their attempt to obtain a nuclear weapon when the achievement of their ambitions is so close? And what would be the time frame for the talks, when Iran is believed to be less than one year from reaching nuclear breakout capability? Delisting the MEK would send a strong signal to the millions in Iran who seek democratic change that the United States is on their side and has shunned the regime. It will tell the mullahs that the United States seriously intends to stop their outlawed activities and support democratic change in Iran just when Tehran is trying to use its influence to keep its anti-democratic and anti-Western partners in power in Syria and Iraq. Delisting the MEK would lift the restrictions on the region's largest Muslim group with a secular agenda and a democratic platform, whose moderate interpretation of Islam strongly threatens the mullahs' fundamentalism. The State Department, which has been unable to offer the courts any sound legal arguments for maintaining the ban on the MEK, now has a legal, moral and political duty to delist the MEK so it is not hampered in its work as the representative of those yearning for democratic change in Iran.